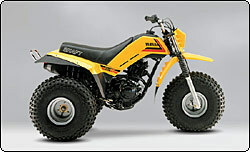 The Tri-Moto was the first Yamaha ATV sold in the U.S.A. It featured a 123cc two-stroke engine, Autolube oil injection system, CDI ignition, a snorkel air intake and a five speed transmission. It was designed to be a durable workhorse as well as the ultimate recreational vehicle. Yamaha introduced the Tri-Moto 225DX. This 4-stroke model was the world's first ATV to feature shaft drive and electric start. Both proved instantly popular in the marketplace. The 225DX also featured Monoshock rear suspension and telescoping front forks. 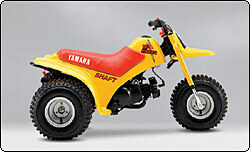 The 59cc Tri-Zinger was the first Yamaha Youth ATV. It featured shaft drive, fully automatic transmission, adjustable speed limiters and a tethered emergency stop switch. Parents could easily adjust engine speed and control the unit as the rider gained experience. 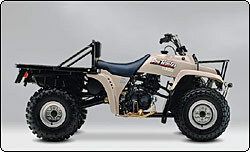 The Moto-4 was the first Yamaha 4-Wheel ATV. It featured a 196cc 4-stroke engine, a snorkel air intake, shaft drive, electric starter, centrifugal automatic clutch, and racks front and rear. A unique feature of this model was a practical reverse gear. 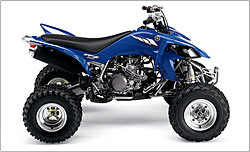 The first Yamaha high performance ATV, the Tri-Z 250 featured a high performance, YZ-based, liquid-cooled, 250cc 2-stroke engine, front and rear hydraulic disc brakes, air-assist front forks, Monoshock rear suspension and a low center of gravity thanks to the under-seat fuel tank. 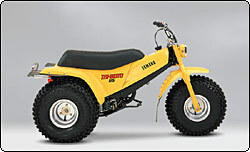 The 4-Zinger was the first 60cc Yamaha 4-wheel ATV. The 4-Zinger featured shaft drive, adjustable speed limiters and an emergency stop switch. Parents could easily adjust engine speed and control the unit as the rider gained experience. The body components and graphics were designed to resemble a small pickup truck. 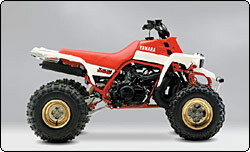 The Banshee was the first ATV to feature a high performance, twin-cylinder, liquid-cooled, 350cc 2-stroke engine - the largest two-stroke engine ever in an ATV. The engine was based on the legendary RD/RZ line of performance motorcycles. 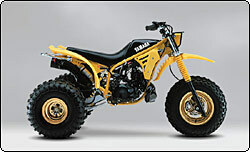 The Banshee won the Baja 1000 its first time entered in the competition. 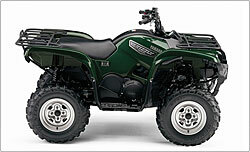 Not only was the Warrior the world's first electric start sport ATV, it's the world's all-time best selling Sport ATV. It features a high performance 350cc 4-stroke engine, 6-speed transmission with reverse, adjustable long-travel suspension and hydraulic disc brakes on the front and rear. 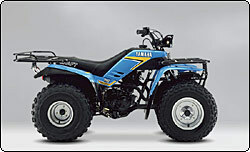 In 1987, Yamaha introduced its first 4x4 ATV - the Big Bear 350. It featured a 350cc 4-stroke engine with an oil cooler, Hi-Lo Range 10-speed transmission with reverse, shaft drive, Torque Control Differential (TCD) for the front wheels, electric start, front hydraulic brakes and an auxiliary DC terminal for accessories. 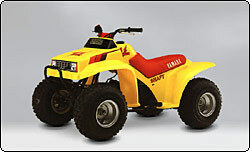 The Terrapro has a unique place in ATV history as the first and only ATV with Power Take Off (PTO) capabilities. This feature enabled the use of a wide range of powered ttachments (rough-cut mower, finish-cut mower, tiller, agricultural sprayers, post-hole digger and more). The Terrapro had a fan cooled 350cc 4-stroke engine, Hi-Lo Range 10-speed transmission with reverse and a locking rear differential. 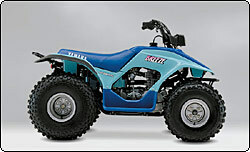 The World's best selling ATV under 250cc is called the Blaster. It debuted in 1989 and featured a powerful 195cc 2-stroke engine, Autolube oil injection, 6-speed transmission, kick starter and double-wishbone front suspension. The Blaster is known for having one of the best power-to-weight ratios in its class. 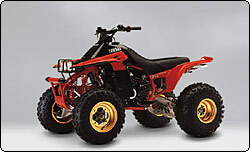 The first ATV with a cargo bed, the Pro Hauler featured a 230cc 4-stroke engine, locking rear differential, sealed drum brakes, reverse gear and an optional thermo switch-controlled electric cooling fan. The standard Pro Hauler model featured a Hi-Lo Range 10-speed transmission and all-terrain tires; while the "Turf" model had turf-tread tires and a Lo Range only transmission for commercial applications. 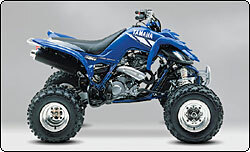 The first Yamaha 4-wheel ATV with automatic transmission, the Breeze featured a 125cc 4-stroke engine, centrifugal automatic clutch, automatic V-belt transmission with cooling fan and reverse, electric starter, foot boards, swing axle front and swing arm rear suspension. The Grizzly 600 brought a new standard of performance, comfort and ease of use to the Utility ATV market with its high torque 595cc engine (the largest engine ever placed in a utility ATV, at the time) and revolutionary Ultramatic transmission. Among the "firsts" on the Grizzly 600 were automatic engine compression braking and push button On Command 2WD/4WD selection. 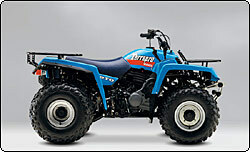 The BearTracker was the first Yamaha ATV built in the U.S. at the Newnan, GA facility. Rugged, reliable and versatile, the BearTracker quickly won the hearts of thousands of owners with its class leading value. 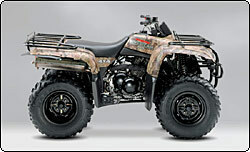 Yamaha introduced its first fully camouflaged bodywork on the Big Bear 400 4x4 Buckmaster® Edition. Blending in was easier than ever with this model designed especially for hunters. 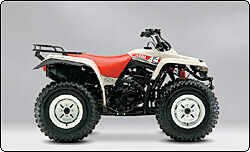 Yamaha created a new benchmark for sport ATVs when it introduced the 660R Raptor. 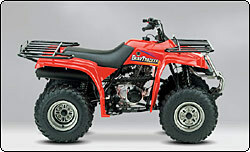 It utilized the largest engine to ever be placed in a sport ATV with the first 5-valve cylinder head in ATV history. 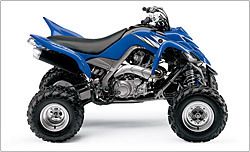 The outstanding engine along with its YZ-spec, 5-speed manual transmission, state-of-the-art chassis and race-honed suspension helped the Raptor win the title of Sport ATV of the Year. The 2002 Grizzly 660 raised the bar for Utility 4x4 ATV performance and convenience by outdooring the first Push Button Front Differential Lock feature. 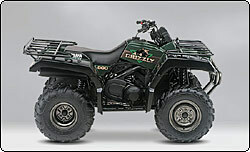 The Grizzly also featured liquid-cooling and the first Yamaha Independent Rear Suspension system. The recipient of virtually every accolade, award and race championship, this revolutionary model set the standard for pure outdoor ATVs, enabling a buyer to go from the dealership to the race track and be competitive. 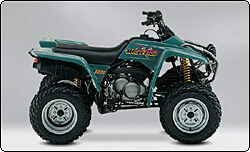 Its powerful, five-titanium-valve engine and 350-pound dry weight gave the YFZ450 the best power-to-weight ratio of any ATV ever produced. An ultra-compact, high-tensile steel frame offered exceptional handling. 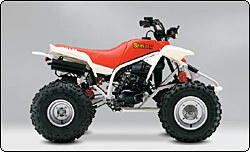 Standard on the YFZ450: pushbutton electric starting, a flip-type parking brake and performance-calibrated suspension served to further distance this model from the competition. A 686cc Yamaha engine helps make this the most powerful outdoor ATV ever, with big torque right off idle transitioning into a fat midrange and monstrous top end. As the first fuel injected outdoor ATV, the Raptor 700R provides crisp, consistent engine performance in a wide range of conditions, regardless of elevation or temperature. And the model’s first-of-its-kind steel and aluminum hybrid frame - with aluminum subframe and cast swingarm – means the Raptor 700R boasts a class-leading chassis and is the lightest ATV in its class. 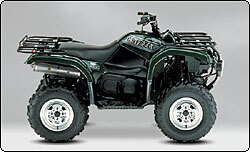 The Grizzly 700 FI is the very first ATV ever offered with Electric Power Steering (EPS) that lightens steering for superior comfort and terrainability.